The Tower Paddle Board Adventurer Inflatable SUP solves a dilemma faced by many stand-up paddle board fans for years. They want something lightweight yet sturdy, something with quality and durability, and something affordable and inexpensive but not cheaply made. For a long time, these combinations haven’t existed. But with this paddle board, outdoor recreation enthusiasts can get a fun SUP that’s easy to pack in and pack out to any water destination, and is also simple to take out without worrying about punctures or sinking underwater like a cheap air mattress. While inflated, it can be easily hauled around or stored on a car’s rack or the backseat. When deflated, it can be rolled up tightly and stored anywhere from a backpack to your garage in the off-season. For a long time, people who wanted to try stand-up paddleboards didn’t have great choices. They had to use the big, bulky boards that were usually hard to move and often came with big price tags. Or they had to settle for something flimsy and unbalanced that could barely support one person, let alone two. The price point was usually better, but the low quality often detracted from the full SUP experience and long-term enjoyment. Here, Tower offers something reasonably priced that delivers plenty of good times and great value. Easy maintenance and storage. When done, simply wash board with soap and water, deflate and roll it up to the size of a sleeping bag, then pack away. Lightweight. Some heftier boards require two people to haul around and launch, but the Tower Adventurer board can be easily lifted and maneuvered into place. Sturdy and stable on the water. Stand-up paddle boarding is an activity that just about everyone can try, but a good, solid board helps you stay afloat and balanced. It’s also designed to withstand routine dings and bumps that might permanently damage other inflatable boards. Inexpensive. Some hard boards can cost thousands. Another alternative is to rent them but costs add up fast if it’s a hobby you do a lot of. The Tower Adventurer is available for a fraction of those high costs. This saves you money that you can spend on other things – like gas to get you to more destinations to play with your board. A thick board. Tower makes the Adventurer at least 6 inches thick, an improvement from many inflatable models that are about 4 inches thick. This adds extra durability, stability and rigidity. Easy to transport. It’s handy to haul around when inflated and when deflated. Or keep it inflated all season! Difficult to repair. You can attempt to patch larger holes like any other plastic device, and a patch kit is included, it may be a challenge creating an effective seal. Paddle problems. The paddle is hefty, but also is made of metal which could sink if accidentally released. Difficult in wind. Paddlers who want to steer into the wind or against the current may have challenges moving forward, compared to traditional boards with larger mass. Incomplete bundle. Though the pump and paddle are useful extras, users also may want to consider purchasing a life jacket and a waterproof bag to store the deflated board. General adventure fans ready for fun. People already generally familiar with stand-up paddle boards who already know the basics of balance, padding and navigation. 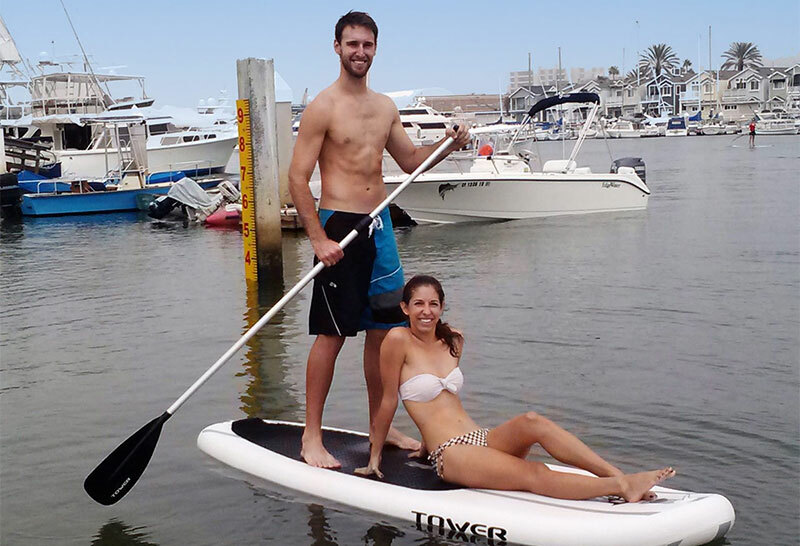 People who already own a SUP but who don’t always want to haul it around. This way, they can choose the appropriate board for every adventure instead of always using the same one. People seeking a long-term investment that can be used, put away, and brought out for future seasons. Longtime SUP users and owners who enjoy extreme adventures and challenging conditions that might badly damage an inflatable. Absolute beginners who have never used any kind of paddle board before. People with little time to play – inflating and deflating take time. If you’re on a limited schedule and want as much time as possible on the water, a harder board might be preferable to haul in and out. Or at least do the inflating ahead of time and the deflating later. For the bulk of users, the Tower Adventurer can take them to any basic paddle destinations. If you’ve had basic experience with SUPs before, and don’t expect any major obstacles or challenging water or weather conditions, it’s definitely a perfect fit. The convenience of something so lightweight that packs in and out so easily is a definite winner.